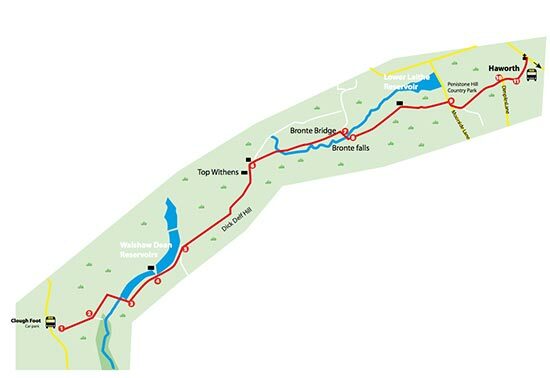 This walk combines the well marked Pennine Way and the Brontë Way. You will see beautiful moorland scenery. You pass Top Withens (the ruined farmstead which was the possible inspiration for Emily Brontë), Brontë Falls, Haworth Parsonage and of course Haworth itself. There is a gradual ascent from the road to the first reservoir and from the second reservoir to Top Withens. Once over Brontë Bridge, there is a gentle incline followed by a long traverse. Some concrete roads but then a lot of moorland scrub in-between the paved path. There are some steps, both for ascent and descent and parts of the route are uneven. There are great places to have a picnic along the way. The walk ends at Haworth where you will find many cafés, pubs and eateries. You will need boots or good walking shoe. It can be windy so take wind and rain proof clothing. Take a 500 bus timetable with you. 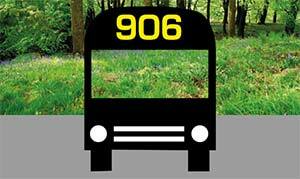 This walk starts at the 906 bus stop at Clough Foot. Go through the green metal gates which are on the right hand side of the road in the direction of bus travel and follow a tarmac road sign-posted ‘Pennine Way’. At the fork, keep left. At the first reservoir turn right to cross the reservoir dam, sign-posted ‘Top Withens 3 miles’. Once across the dam, turn left, following the path, way-marked PW (Pennine Way). At the next http://healthsavy.com/product/diflucan/ reservoir dam, follow the signpost ‘Pennine Way’, keeping on the left side of the drain after crossing the little bridge. 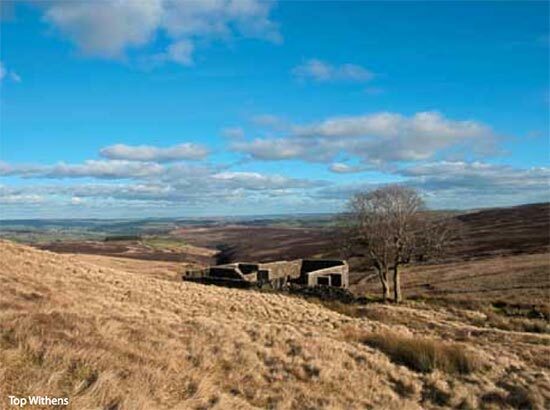 Continue following the Pennine Way signs ‘Top Withens’. Half way along the second reservoir, the footpath meets a track. Follow the track uphill through a metal gate. At the signpost, some 100m ahead, bear right up the slope. As you climb, take the paved path bearing to the right. As you crest the hill, Top Withens will be clearly visible on the left of the path ahead. Continue past Top Withens and another ruined farmstead on the left, turn right to follow the Brontë Way path, signposted ‘Haworth and Brontë Falls’. The Brontë Way is popular and easy to follow. It crosses a stream, moorland and an open field, before eventually dropping down to a three way signpost next to a kissing gate. Here, you turn right through the gate, downhill to the Brontë Bridge. After the Bridge, turn left and follow the footpath uphill where it merges with a track that leads to the minor road, Moorside Lane. Continue on this path until you reach a minor road, Dimples Lane. Go straight across the road to pick up the walled lane opposite. At the bottom of the lane, turn left at the signpost ‘Haworth’ following a paved path which brings you to the Church and your destination. From Haworth, you can get the hourly 500 bus back to Hebden Bridge. The stops are at the bottom of the main street opposite the Old Hall pub and opposite the railway station.